Wonderful updated rental. Open floor plan with approximately 975 square feet. Half block from Beach Blvd. and Main St. Covered parking for two vehicles. Sleeps six, one bedroom with King Bed! The other has two twin beds and there is a queen sleeper sofa in the living room. HD Cable service with music channels and internet access. TV in living room and king bedroom. Fully furnished with linens, towels, dishes, appliances, coffee pot, icemaker, and washer/dryer. Central heat and air. Walk to everything, restaurants, and bars, shopping, boating, and swimming. Walk the beach or the Bay Bridge. Many local attractions, golf, casinos, boating and fishing opportunities. NOTE: Attached 2b/1b may be available for larger families and friends. Enjoy Old Town Bay St Louis while participating in one of the many local festivals, events, and regattas. Annual Cruisin’ the Coast. Nice covered parking for your special vehicles!! 1 hour from New Orleans, Louisiana., where you can visit the Audubon Zoo, Aquarium of the Americas, IMAX Theater, Historic French Quarter, and Famous New Orleans Restaurants. To book this property, click on the 'Book It' button to the right of the property picture. Enter your arrival & departure dates and the number of adults, children, and if you have a pet. Then click on 'Continue To Booking'. When you reach the Rental Agreement paragraph, click on the blue highlighted words; 'rental agreement, then click on the words; 'Download rental agreement'. Type in your info, save agreement to your computer and print it. Then you either email the completed agreement or fax it to MANIERI REAL ESTATE, LLC. This property is managed by MANIERI REAL ESTATE, LLC. I am the property manager, Joey Manieri and I manage this property as well as others through my company, MANIERI REAL ESTATE, LLC. I would like to welcome you to the Misssissippi Gulf Coast. My company specializes in Rentals, Property Management & Sales in the Bay St. Louis area. Comfort & Quiet If this property is already booked for your dates, then the unit next door, VRBO #490042 may be available or one of our other properties that we management. You may email me at manierij@bellsouth for our additional VRBO listing numbers. Close to Beach, Harbor, Restaurants, & Shopping. Located downstairs in utility room. Large kitchen open to living room. One in living room & one in Master bedroom. Pet friendly. No fenced yard, but plenty of places to walk, jog or run with your canine companions. Please doo pick up the poo! Table and chairs on Balcony, 6 foot picnic table on ground level. This rental is nicely situated in Old Town BSL and is walking distance to everything. There are easily 10 restaurants within a few blocks. There are also a variety of unique shops close by. We loved walking our dog along Beach Street and the bay as well wandering the residential streets. It can be a bit noisy with delivery trucks to the closest restaurants (mornings) as well as music from other restaurants (evenings). And there are trains. Tracks are only a few blocks away so you do hear them, but we found none of this particularly bothersome (we kept doors and windows closed). The property is open and the furniture is comfortable, seems relatively new. For our six week winter stay, we found it a bit lacking in a few details (we bought a rug for the bathroom as well as a 2 qt saucepan for the kitchen, both of which we left; also purchased heavier towels and more hangers which we did not leave) but, all in all, we were quite comfortable here even when it was cooler and wetter than usual. It is undoubtedly perfect for shorter stays and absolutely perfect or other seasons! The one negative didn't impact our comfort, but the exterior appearance does not give a particularly positive first impression. The stairs need paint, as do the railings, the indoor-outdoor carpeting really needs to be replaced. It's worn through in places, actually patched in some. Our understanding is that the building is due for some improvements this year and that will make a big difference. Great, clean spot right in the heart of Bay St. Louis. Will definitely return. Joey was very hospitable. We were very pleased with the location of the property. 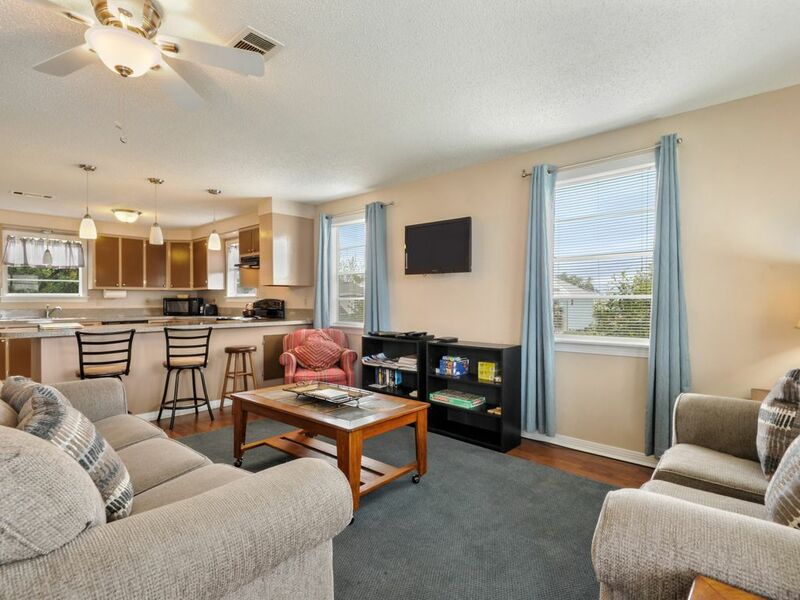 It’s walking distance to all of the Beach Blvd restaurants and only a few minutes of a car ride from the beach! My only complaint is I wish there were a few more pots and pans for cooking but not a dealbreaker by any means! We will definitely stay here again in the future!!! We found ourselves without a home after our house in Louisiana sold early! We spent six weeks (June thru mid-July) in this apartment and it was just what we needed. The only reason it didn't get 5 stars was because the live music coming from the waterfront had a tendency to get loud and was fairly audible in the apartment. For a short stay - probably not a problem, but for six weeks, it got a little bit old...maybe I'm just old! We would definitely recommend this place to anyone who wants to get away to the gulf coast and enjoy some time in charming Bay St. Louis, or any of the other local areas. We fit 5 people (with the addition of a twin-size air mattress) and other than some occasional bathroom wait-time conflicts (expected) it was no problem. The kitchen and living space are large enough for everyone to have their comfortable space. We would highly recommend some of the local restaurants...C&C Italian Bistro provided our favorite meal! and Pop Brothers popsicles help cool you down on hot nights. We are runners and found the running opportunities to be plentiful and safe. This property is centrally located for special events such as Second Saturday, Harbor Fest, Crab Fest, Cruisin The Coast and Bridge Fest. All within walking distance including just touring the historic district of downtown Bay St. Louis. Also within walking distance are restaurants, bars, & shopping. All Festival dates & Events change annually. The dates we have posted for festivals & Events are subject to change per city/county changes. Vacationers are cautioned to verify festival and event dates prior to booking. $59.00 Non Refundable Accidental Damage Protection provides you with up to $2,000.00 property damage protection, tenant accepts responsibility for damages over $2,000.00.